Our children need—and deserve—healthy food. A diet rich in fruits, vegetables, lean proteins and whole grains, as recommended by the U.S. Department of Agriculture (USDA) and nutrition experts, can help kids grow up physically healthy, mentally alert, and capable of meeting the challenges of adulthood in the 21st century. But in a food system dominated by unhealthy, artificially cheap processed foods, access to healthy food is a serious problem for many American children. As a result, childhood obesity has grown rapidly over recent decades—especially for low-income and minority children—with long-term health consequences that will shorten lives and send health care costs soaring. In this grim food landscape, there’s one oasis for millions of kids: the school cafeteria. The National School Lunch Program (NSLP), created by Congress in 1946 and shaped by additional legislation over the following decades, provides support—mostly in the form of cash subsidies—for schools to provide meals to students. Participating schools must serve lunches that adhere to federal nutrition standards, and they must offer free or reduced price (FRP) lunches to children who qualify. For many students, NSLP meals are a crucial source of healthy foods that their families may not have the access, money, or time to provide during the rest of the day. The program also turns lunchtime into an opportunity for nutrition education: by showing students what a healthy diet looks like, the school can provide a counterpoint to the steady stream of messages promoting unhealthy, processed foods to children and their parents. 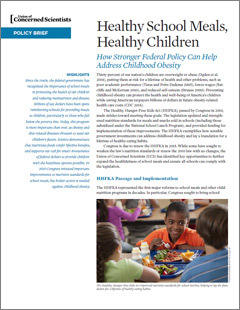 In the Healthy, Hunger-Free Kids Act of 2010 (HHFKA), Congress improved the program’s nutritional standards, bringing them into better alignment with current federal dietary guidelines. Although there is considerable evidence that HHFKA is working, it has provoked a backlash from some school nutrition professionals, who claim that it has resulted in increased waste and negative attitudes toward healthy food. To assess how well subsidized school lunches succeed at putting healthier food in kids’ mouths, UCS analyzed data from a Department of Education study that tracked the eating behavior of a cohort of students. The study surveyed the group as fifth graders in 2004 and again as eighth graders in 2007. The resulting report, Lessons from the Lunchroom, shows that federally subsidized school lunches do make a difference: children who were FRP lunch recipients ate more fruits and vegetables than their peers who were not. However, the report also confirms the challenges that school lunch programs face in the larger food environment: FRP students consumed more fast food and sugary drinks than non-FRP students, and they were more likely to be obese, a difference that increased between fifth and eighth grade. In 2015, the Healthy Hunger-Free Kids Act is up for renewal. This is a crucial opportunity to strengthen what is working about current federal school lunch policy and to provide support for schools that have struggled to implement HHFKA successfully. 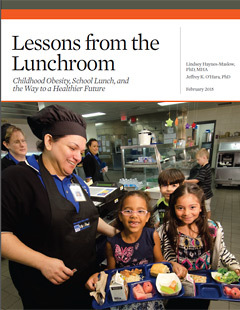 Our policy brief, Healthy School Meals, Healthy Children, offers several specific recommendations that Congress should incorporate into a renewed HHFKA—including increased reimbursement funding, better nutrition education, investment in cafeteria equipment, and increased support for Farm to School programs. Ultimately, both the successes and the challenges of school lunch programs point us back to the bigger picture: the need for a comprehensive national food and well-being policy that will align food-related public policy initiatives around a consistent set of priorities, with the goal of ensuring access to healthy, sustainably grown food for every American. UCS has begun working with a broad range of allies to build a movement that will make such a national food policy a reality. Helping kids eat healthier is an issue that we all have a stake in. To find out more about what you can do to promote access to healthy food in your community, download our healthy food policy toolkit. Childhood obesity is a major problem, but school lunch programs are helping kids eat healthier.